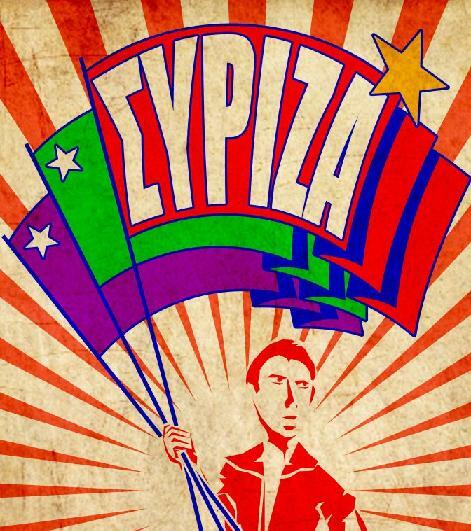 (1) Greek elections: We just posted an article by Mike-Frank Epitropoulos on tomorrow’s elections in Greece, and what a SYRIZA election would mean: A Second Demonstration Project for Greece. The title alludes to the article Mike wrote for us back in May 2010, Greece as a Demonstration Project. Back then, the architects of austerity were using Greece as a demonstration project to see how a country’s population reacted to vicious austerity. Today, those same elites are worried about what the election of an anti-austerity, sometimes anti-capitalist party in Europe would demonstrate for people elsewhere in Europe and around the world. Also: check out the interview on RT with left economist Yanis Varoufakis, who will become Greece’s finance minister if SYRIZA wins. A highlight: in Pt. 2 Varoufakis speaks of the “fiscal waterboarding of Greece” (around 20:18 in the video). The SOTU machine reminded me of the Oliver Sacks essay, The President’s Speech, from his book The Man Who Mistook His Wife for a Hat, about the reaction of patients in the aphasia ward to a speech by “the old Charmer, the Actor, with his practised rhetoric, his histrionisms, his emotional appeal” (clearly Ronald Reagan, though he is not named explicitly–and how great a word is “histrionisms”?). The patients, some of whom could apprehend non-verbal cues but not the literal meanings of words, others of whom can only apprehend the literal meanings, were either convulsed in laughter in response to Reagan’s antics or darkly disturbed. More seriously: hat-tip to TM for pointing me to Lambert Strether’s post-SOTU commentary in his Water Cooler from Tuesday. Via the Real News Network, an interview with Kshama Sawant, socialist Seattle city councilor, about SOTU, The Socialist Response to the State of the Union. (3) Sue Holmberg on the Van Hollen Plan: Over at New Deal 2.0 of the Roosevelt Institute, this piece: The Van Hollen Plan Takes on Soaring CEO Pay: A Debate We Need to Have. (4) What’s Wrong with Mainstream Economics: Two pieces discussing what’s wrong with mainstream economics, and whether there is anything wrong. First, from Noah Smith at Bloomberg View, Economic Stars Swing Left, which tries to respond to the activism at the recent economic meetings (ASSA protests) that we reported on (here), claiming that the protesters are off base, because the most publicly visible economists (Krugman, Stiglitz, Piketty, etc.) are leftists. … if the protesters bothered to look around, they would see that their wish has been coming true for decades. Over the past quarter-century, economics has been shifting from singing the praises of free markets. Instead, it has moved toward a greater focus on inequality, human welfare and the ways that markets break down. If you can get beyond the condescension, you may find it funny that Smith cites right-wing economist and pundit Tyler Cowen to back up the claim that Paul Krugman is today’s Milton Friedman. Utter nonsense Noah. This isn’t about economics swinging right or left. It’s about economics opening itself up to pluralism. Everyone you mentioned in this article is a neoclassical economist. Neoclassical economists like Krugman or Piketty may sit to the left of other mainstream economists like Mankiw, Summers or Reinhart, but that does not mean that the profession is becoming less rigid in terms of the schools of thought and methodology that are considered legitimate. Neoclassicism and its fundamentally flawed assumptions still rule the day. And in terms of the incompatibility between our protest of the narrow mathematical/ objectivist/pseudo-scientific formalism of neoclassical economics and our protest of Carmen Reinhart’s reckless, ideologically-driven arrogance — there really is none. In both cases the common denominator is a hubristic belief in the fundamental inviolability of the mainstream worldview. Had you bothered to actually reach out to us and attempt to obtain an accurate understanding of our message, you would have realized that we’re not taking a doctrinaire leftist perspective but protesting the extreme narrowness and provincialism of mainstream economics. Meanwhile, there was a more serious and bigger-league (than Noah Smith) debate on the same kind of topic in the pages of the New York Review of Books, when Arnold Packer and Jeff Madrick responded to Alan Blinder’s somewhat negative review of Madrick’s great book Seven Bad Ideas, and Blinder responds in an exchange called “What’s the Matter with Economics?” An Exchange. According to Packer, “Blinder concludes that except for some right-wingers outside the ‘mainstream’ and politicians’ refusal to accept economists’ recommendations, little is the matter and Seven Bad Ideas constitutes ‘serial exaggeration. '” The debate is again about whether mainstream economists are mostly right-wing, but it ‘s also about how much policy influence economists have. Blinder, whom both Packer and Madrick praise as one of the best of the mainstream economists, seems to say that mainstream economists don’t have enough (or governments wouldn’t have pursued austerity policies), whereas Madrick and Packer (and Harrington and the economists who write for D&S) say mainstream economists have too much influence (or governments wouldn’t have pursued austerity policies). If you believe Carmen Reinhart, who after the protests claimed that she herself is “heterodox” (and Noah Smith supported that claim), then you’d have to disagree with Blinder, since if that whole Reinhart/Rogoff kerfuffle (see here) showed anything, it was that economists like Reinhart and Rogoff (a) are mainstream and (b) have political influence to support austerity. (4) Judith Butler on Black Lives Matter: I want to recommend a great interview with philosopher Judith Butler at the New York Times‘s philosophy blog, The Stone: What’s Wrong With ‘All Lives Matter’? I, along with about 10% of the online commentators, thought that Butler’s analysis was really great. If you have a couple of hours to waste and your blood pressure is too low, read the rest of the comments, which range from outrage about her failing to talk about Mike Brown’s alleged crimes and character, to failing to talk about “black-on-black crime,” to scorn at the obscurity of theory. (Seriously, this interview is very clear as philosophy goes, and if you don’t like theory, why are you reading a philosophy blog? It’d be like reading a math blog and complaining about the formulae.) Anyhow, I recommend the interview, but not the comments. (5) Sasha Breger Bush, Gambling on Hunger and Climate Change: Sasha Breger Bush, who will be contributing to our March/April special issue on food and farms, has a piece in the Transnational Institute’s State of Power 2015, just released to coincide with the World Economic Forum in Davos. Her piece is called Gambling on Hunger and Climate Change.